LAKELAND, Fla. – Florida Polytechnic University is now officially open and ready to welcome its Inaugural Class. Florida’s newest state university held a public LAUNCH Celebration on Saturday to commemorate its grand opening and the completion of the iconic Innovation, Science and Technology (IST) Building. 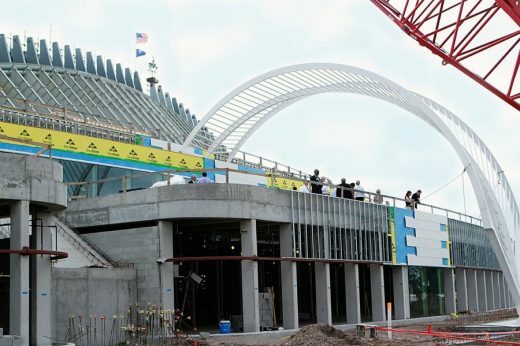 Florida Polytechnic leaders, Governor Rick Scott, and more than 1,000 supporters and new students gathered to experience the state-of-the art University up-close for the first time. A formal ceremony was followed by an actual launch – a vivid pyrotechnics display showered a campus lake adjacent to the IST Building. “I’m grateful to all of the special guests and supporters who have joined us to celebrate the launch of Florida’s next great university,” said Florida Polytechnic President Dr. Randy K. Avent. Dedicated exclusively to STEM (Science, Technology, Engineering and Mathematics), Florida Polytechnic’s approach to learning emphasizes real-world problem-solving, work experience, applied research and business leadership opportunities through industry partnerships. Leaders from across the state were on-hand to celebrate the new University, including Governor Rick Scott, Commissioner of Agriculture Adam Putnam, Representative Seth McKeel, Governor Wendy Link of the Florida Board of Governors and former Florida Senator J.D. Alexander. Saturday’s LAUNCH Celebration followed PIVOT, a philanthropic gala on Friday evening, which generated more than $3.6 million to support scholarships for Florida Polytechnic University’s Inaugural Class. Both PIVOT and LAUNCH took place in and around the University’s cornerstone structure. 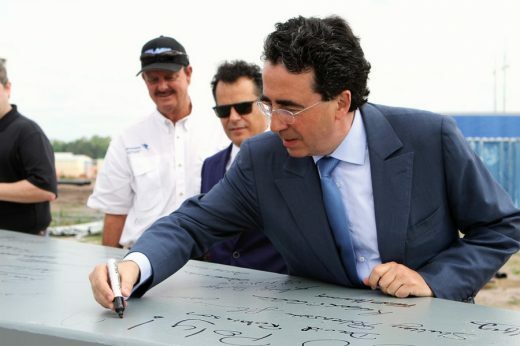 The IST building’s noted architect Dr. Santiago Calatrava also participated in the LAUNCH Ceremony. Calatrava, world-renowned for his stunning feats of modern architecture, shared his inspiration for the IST Building. A moveable and functional work of art, the 162,000-square-foot, white domed IST Building features a distinctive louvered roof system that adjusts with the sun’s angle and is surrounded by a ring of curved metal pergolas that shade its outer terrace and walkways. It houses classrooms, auditoriums, administrative offices, common areas and a number of cutting-edge laboratories, including a Supercomputer and Student Data Center, a Visualization and Technology Collaboration (VTC) Lab, and a Rapid Application Development (RAD) Makerspace Lab with 3D printing capabilities. Construction of the IST Building took 28 months and was completed by Skanska USA. Headquartered in New York, Skanska USA is one of the largest construction and development companies in the country with expertise in construction, civil infrastructure, public-private partnerships and commercial development initiatives in select U.S. markets. 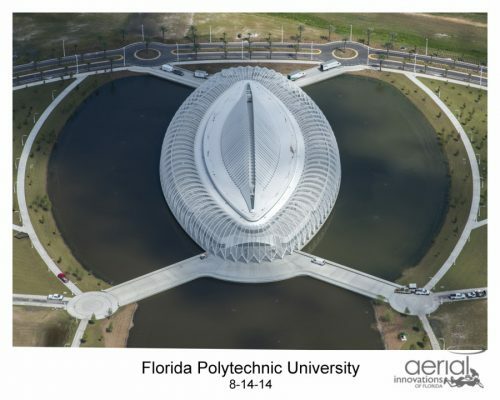 With the IST Building and residence hall complete, Florida Polytechnic is now ready to welcome students for the inaugural day of classes on August 25, 2014. The University will offer six undergraduate degree programs with 19 unique areas of concentration and two masters degree programs in the College of Engineering and the College of Innovation and Technology. The new Innovation, Science and Technology Building is one step closer to completion as the steel framework is now finished. 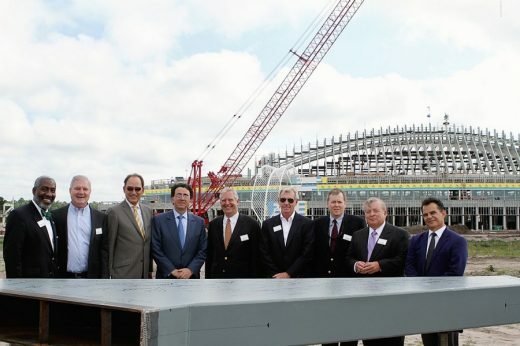 To celebrate this milestone, a crowd of more than 250 people attended a “Topping Out” Ceremony. Florida Poly Board of Trustees Chair Robert H. Gidel gave the welcome remarks and introduced the keynote speaker – Dr. Santiago Calatrava, the world-renowned architect of the building. After both men spoke, Chuck Jablon, Vice President of Operations of Skanska, thanked the construction workers and the crowd cheered as the final stanchion was hoisted to the top of the building. The stanchion was signed by members of our Board of Trustees and Foundation Board of Directors. Following tradition, a tree and flag were also placed at the top of the building to symbolize growth and to bring good luck. 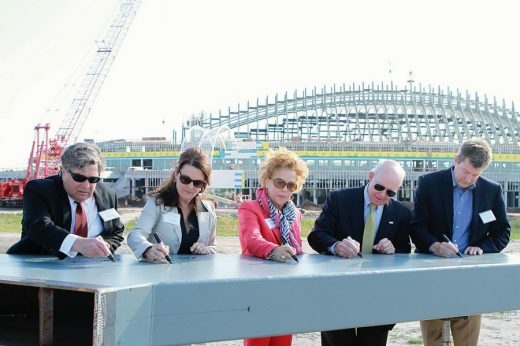 Upon completion in June 2014, the 160,000 sqft USF building will house classrooms, auditoriums, research and teaching labs, and offices for faculty and academic administrators. 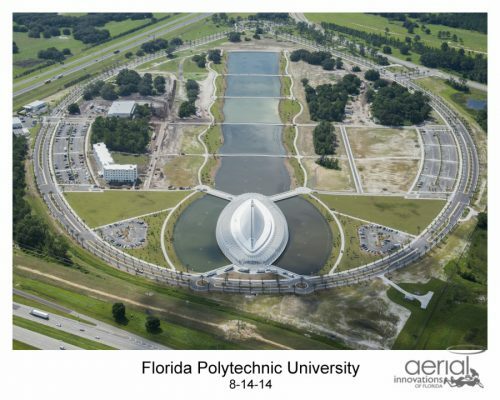 May 3rd, 2011 (Tampa, Florida)…The University of South Florida Polytechnic has named Alberto Alfonso, AIA as executive in residence and interim program development director for architecture and design. Alfonso is a founding principal and president of Alfonso Architects Inc. of Tampa, Florida. In his USF role, Alfonso’s responsibilities will include developing the curriculum for the undergraduate program in architecture and design, conducting national and international searches for new incoming facility positions, planning for a study abroad program in France centered on the work of the late master architect Le Corbusier, and developing national and international relationships with other Polytechnic programs. Alfonso is working in partnership with Santiago Calatrava on designing the new campus for USF Polytechnic in Lakeland, Florida. Tentatively scheduled to begin in 2013, the bachelor’s program in architecture and design is part of USF Polytechnic’s strategic plan to expand its programs as it prepares for the opening of its new campus. Alfonso’s appointment runs from April 15, 2011, to June 30, 2015. Cuban born, Alfonso was educated at The University of Florida where he received his M.A. in 1983. With his brother Carlos and partner Angel del Monte, Alfonso Architects, Inc. was founded in 1988. Alfonso’s love of architecture developed at an early age as he was raised in the house of an architect: his father Carlos E. Alfonso, Sr. Carlos Alfonso, Sr. began his career in Havana, Cuba and fled the country with his family in 1960 to begin a successful practice in Tampa, Florida. Alfonso received the prestigious American Institute of Architects State of Florida 2008 Design Honor Award. This award is given an individual architect, who has, by the high quality and originality of one’s design and body of work over a period of 10 or more years, advanced the cause and public value of good architecture in the state of Florida, and, by one’s leadership, has provided an inspiration to colleagues. Alfonso also received the 1987 Eduardo Garcia Award from the Florida Central Chapter of The American Institute of Architects. This award is given to the top Architectural Designer in the six county Central Florida area and is based on a submitted body of work. Recent projects recognized by the State of Florida AIA Design Awards program include the Tampa Covenant Church, Tampa International Airport Airside C, Nielsen Media Research Global Technology Center (a 650,000 s.f. corporate campus headquarters), University of South Florida Center for Advanced Healthcare Frank and Carol Morsani Center, the University of South Florida Medical Office Building, the Mission of St. Mary Chapel, the University of South Florida School of Psychology building, and the Hillsborough County Downtown Partnership Urban K-8 school. Alfonso designed the Chihuly Collection, which opened in July 2010 in St. Petersburg, Florida. The 10,000 sq. ft. installation marks the first time glass artist Dale Chihuly has collaborated with an architect on a permanent exhibition of his work. 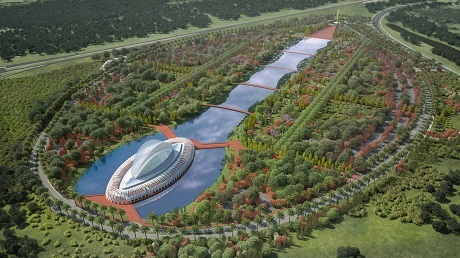 The University of South Florida Polytechnic (USFP) has commissioned the acclaimed architectural firm Santiago Calatrava/Festina Lente Services (FL), Inc. to design the first building for the school’s new campus in Lakeland, Fla., and update the campus master plan, University of South Florida President Dr. Judy Genshaft announced today. Santiago Calatrava will design the 100,000 net square foot USFP Science & Technology building, which will sit on the northernmost corner of the campus at the intersection of Interstate 4 (I-4) and the Polk Parkway. The Science & Technology building will be the cornerstone of the new campus, and will establish the design scheme for all buildings within phase I of the campus master plan. Groundbreaking is expected late this year, with a scheduled opening in late summer 2012. Calatrava is best known for his celebrated designs of bridges, transportation centers and cultural institutes throughout the world. The USF Polytechnic facility will be his first design in the southeastern U.S. Almost 70 years ago, legendary architect Frank Lloyd Wright made his mark on Lakeland with the Annie Pfeiffer Chapel, the first of 12 structures he designed for Florida Southern College and a recent addition to the World Monuments Watch List. With today’s announcement, the once-sleepy orange grove town. now at the center of Florida’s High Tech Corridor. will again be home to internationally acclaimed architecture. The Calatrava commission follows a Florida Chamber of Commerce statewide voter survey that showed support for directing more of the state’s economic resources to fostering talent, rather than relying on tourism and in-migration for economic development. USF Polytechnic, designated Florida’s only polytechnic in 2008, focuses on hands-on learning that cultivates skills in the applied arts and sciences, business and education. Since its founding in 1988, USF Polytechnic has shared a campus with Polk State College in Lakeland. When complete, the new campus will offer the space and resources the university needs to expand from its current 4,229 student body to 16,000 students. The prime I-4 location also affords the university visibility along one of the nation’s most traveled commercial and tourist routes, the interstate connecting Tampa and Orlando, Fla. In 2006, University of South Florida President Dr. Judy Genshaft brought Dr. Marshall Goodman to Florida as campus executive officer and vice president for USFP and charged him with transforming the landscape. Goodman sees the parallels between Central Florida and Silicon Valley, where he served as provost at San Jose State University. “By developing a world-class educational facility in the midst of a growing technology corridor that connects Florida’s largest concentrations of population, we are in fact transforming the future of Lakeland, Polk County and Central Florida,” he said. USF Polytechnic has already exceeded expectations in enrollment and is the fastest growing of USF’s four regional campuses. USF Polytechnic currently serves 4,229 students, a 25 percent increase over the prior year. “USF Polytechnic is unquestionably the most important economic development project I have worked on in more than 20 years of service in our community, and I tell people all the time that it is the most important project of their lifetimes, as well. USF Polytechnic is an incredible anchor here in Lakeland and Polk County, and will serve as a catalyst to attract more high skill/high wage jobs to our region,” said Steve Scruggs, executive director, Lakeland Economic Development Council. Following a series of public meetings and presentations to the USFP Campus Architect Selection Committee, as well as an extensive due diligence process, world-renowned architect Calatrava was selected in November 2008 to design the first building on the new USF Polytechnic campus. With the contractual process now complete, the Calatrava team will begin work on conceptual designs for the Science & Technology building, which is projected to cost $45 million and will use a combination of public and private funding. for his projects, including the Montjuic Communications Tower in Barcelona, Spain; the Turning Torso in Malmo, Sweden; the Athens Olympic Sports Center in Athens, Greece; and the Quadracci Pavilion of the Milwaukee Art Museum in Milwaukee, Wis., his first project in the United States. Calatrava was commissioned to design the new World Trade Center Transportation Hub for Lower Manhattan in late 2003 and has numerous projects in progress throughout cities worldwide. Santiago Calatrava/Festina Lente will operate in partnership with Tampa-based architectural firm Alfonso Architects on the project. To watch a video of USF, USFP and Calatrava announcing the design commission, and download photos and press materials on the new USFP campus, visit www.poly.usf.edu. 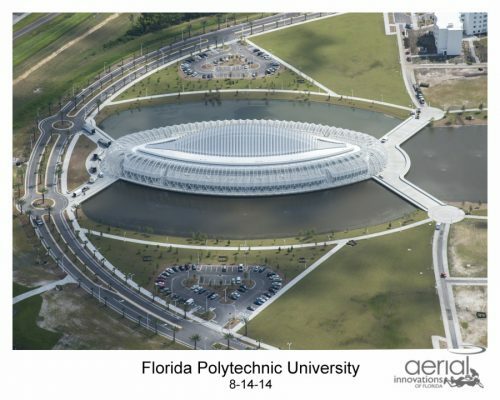 The University of South Florida Polytechnic, located in Lakeland, Fla., is the state’s first and only polytechnic. As an integral part of the USF system, USF Polytechnic delivers bachelor’s and master’s degrees, as well as a variety of online, certificate and continuing education programs. The polytechnic model emphasizes applied learning and research and intensive collaboration with economic development partners in the region. Vibrant student life and challenging multi-disciplinary programs in fields such as information technology, engineering, business and education provide a distinctive educational experience at the heart of Florida’s High Tech Corridor. In November 2002, the USF Board of Trustees approved the issuing of a request for proposal for a new campus site, and in December 2002, a Land Acquisition Committee was appointed. This committee included both University and community members representing a broad constituent group. The consulting firm of Reynolds, Smith, and Hill was contracted to work with the committee to perform land evaluation and to prepare the Campus Master Plan. Five proposals for campus sites were received in January, 2003 and were reviewed and evaluated over the next several months. In July, 2003, the Land Acquisition Committee identified the Williams Company proposal as the one to recommend to the USFL Campus Board. In August, 2003, The USFL Campus Board accepted the Williams Company proposal which included a donation of a 530+ acre site at the intersection of Interstate 4 and the eastern terminus of the Polk Parkway. Subsequently, in November 2003, the USF Board of Trustees approved the development of a new USFL Campus on the Williams’ property. A signing ceremony took place on the Lakeland Joint-Use Campus site on November 22, 2004. In addition to the value of the land, the Williams Company will also contribute $600,000 to establish the Williams Endowed Professorship in Information Technology. The gift will qualify for a $420,000 match from the State Trust Fund. The endowment will be paid in 5 annual pledges, the first pledge to be paid when ground is broken for the first building on the new campus site. The development of the Campus Master Plan was guided by projections of enrollment increases and program development over the 10 year period 2005-2015. The academic programs consider USFL’s response to community and economic development needs and establish or enhance programs in a direction of applied research in a polytechnic approach.